The official programme marking World Food Day takes place today at the Universal Exposition in Milan, under the theme, “Social Protection and Agriculture: Breaking the Cycle of Rural Poverty”. This theme underscores the role of social protection in ensuring that food and other basic needs of the most vulnerable individuals and households are addressed. Furthermore, embedded in this theme is the assertion that social protection programmes tied to productive activities, such as agriculture, are the most sustainable approach to eradicating poverty and achieving food and nutrition security. This has considerable implications for Sub-Saharan Africa, where poverty is pervasive in rural areas. Sub-Saharan Africa, especially the Sahel and West Africa region, is one of the poorest and most food-insecure regions in the world. Out of the 25 poorest countries in the world, 23 are in Sub-Saharan Africa with 11 of them in the Sahel and West Africa Region. It has the world’s fastest growing population, where 65% of countries are classified as low-income countries and over half of the population is living below the poverty line. To address the high levels of food insecurity and poverty, a number of social protection initiatives have been put in place, including national social protection strategies in some countries. In 2014, the European Union alone assisted 1.7 million food-insecure people and 580 000 malnourished children in the Sahel. This has provided a strong argument and a basis for a pro-smallholder agricultural intervention in rural areas in the Sahel and West Africa region. © Map produced by CILSS/Agrhymet. 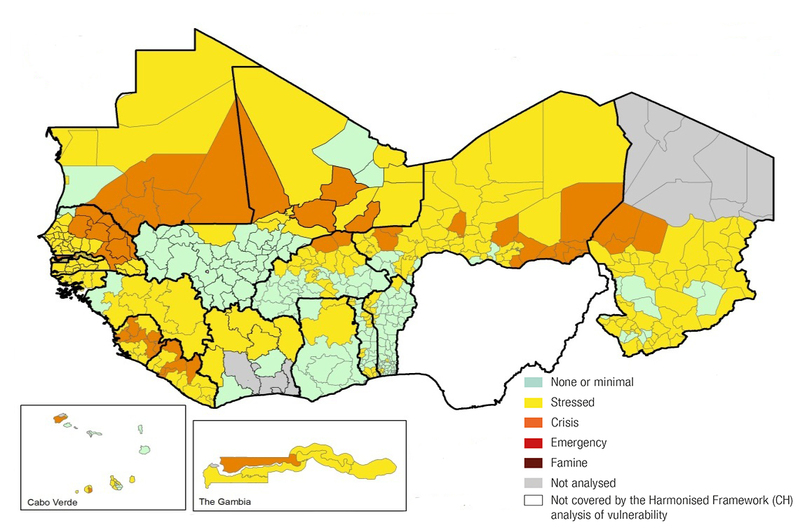 Source: Regional analysis of the Cadré harmonisé (CH), Bamako, 22-23 June 2015.